It’s always interesting to learn why an author chose to write about a particular subject. 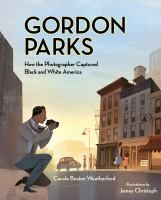 Carole Boston Weatherford explains that she met Gordon Parks, a photographer whom she admired, at an exhibit of his work. She had grown up viewing his photos in Life magazine. As an adult, her Aunt Helen told her about working with Parks in Washington, D.C. Weatherford has a picture of her aunt that may have been taken by Parks. 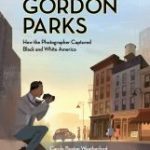 Gordon Parks (1912-2006) was a world-famous photographer, novelist, poet, musician, and film director. He was the youngest of fifteen children, and he was raised amid poverty and segregation. After both parents died, Parks was struggling to support himself when he was fifteen years old. He worked as a busboy, piano player, porter, and waiter. As a waiter in a railroad dining car, Parks noticed glossy photographs in magazines. He spent $7.50 to buy a used camera and taught himself how to use it. Parks was soon hired to shoot fashion and portraits. When he moved to Chicago, Parks recorded the plights of impoverished families, and this earned him a fellowship with the Farm Security Administration in Washington, D.C. It was there that he was once again struck by the poverty experienced by the black families who lived in the shadows in our nation’s capital. Parks embarked on a mission to expose the racism that he saw, and he chronicled the life of Ella Watson, a cleaning woman in the building where he worked. Mrs. Watson supported herself, her grandchildren, and an adopted daughter on just $1000.00 a year. He had the idea to photograph Mrs. Watson in a pose reminiscent of Grant Wood’s famous painting, American Gothic. 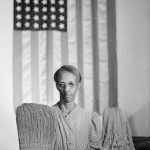 (Photo taken from Wikipedia) Parks placed his subject in front of an American flag holding a mop and broom, and he titled the photo, American Gothic, Washington, D.C. This stark image engendered much discussion, and it became one of Park’s most noted works. While continuing his career as a fashion photographer, he went on to use his camera as an instrument of change by illustrating scenes of segregation and poverty. Later in his life, Gordon Parks wrote a novel, The Learning Tree, which he also directed as a feature film. He was the director of the 1971 movie, Shaft. 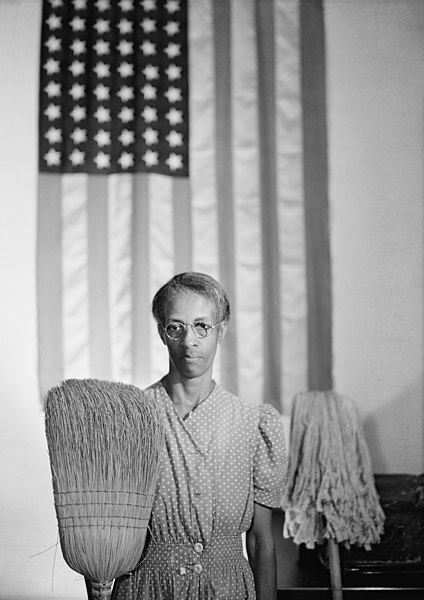 Gordon Parks became recognized, not only as an artist but also as a humanitarian.